To join the Putnam Training Sessions and prepare for the 2013 event, contact Daniel Onofrei or Andrew Török. Ready to be challenged by math problems? Join the University of Houston’s Putnam Competition Group this fall to train for the December competition. 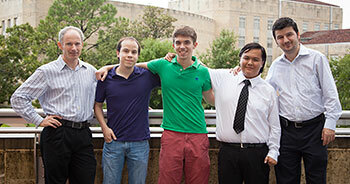 Last year, a group of University of Houston undergraduate math majors participated in the William Lowell Putnam Mathematical Competition. Held annually, the competition stimulates a healthy rivalry in mathematical studies among colleges and universities in the United States and Canada. The competition, open to undergraduates, consists of two sessions of six problems each, and is held on the first Saturday of December. In 2012, 4,277 students took part in the competition with 578 teams registered. Each university administers the Putnam problems on campus and submits the students’ results to the competition for evaluation. The Department of Mathematics organizes the test at UH and provides lunch for contestants. “Although the competition assumes the equivalent of a freshman background covering subjects from algebra, number theory, elementary geometry and calculus, the problems are extremely challenging and interesting,” said Daniel Onofrei, assistant professor of mathematics and one of the faculty members who organizes UH’s participation. This fall, Onofrei and professor Andrew Török are organizing weekly problem-solving sessions with students interested in tackling the Putnam Competition. “The sessions help develop the reasoning behind a solution and ways to attack a new problem. We welcome all interested students to join,” Török said. The preparation sessions for the 2013 competition will be held on Mondays, from 4-6 p.m., in the large classroom of The Honors College. The UH Putnam team members for 2012 were Gregory Funchess, Huy Dinh and Alonso Miranda. Funchess scored 19 points, and Dinh and Miranda scored 10 points each, obtaining a team rank of 87. “This was an excellent performance given the fact that half the participants in this competition score 0 points,” Onofrei said. “Gregory’s score was only 4 points away from making the Top 500 list.” The Putnam Competition’s Top 500 list serves as a recommendation for graduate school fellowships and goes out to relevant U.S. graduate programs in mathematics, physics, computer science, and mechanical and electrical engineering. Funchess, Dinh and Miranda enjoyed the challenge provided by the Putnam problems. Funchess likened the competition to experiencing the art of math and encouraged others to participate. “This contest really exposes you to the adventurous side of math, not the classroom side where there are set steps and procedures. This is the playful side of just trying out new ideas and hoping they’ll work,” he said. “Putnam taught me to be a more patient and persistent as a student. It also helped me get a better feel for the type of math I want to pursue,” said Dinh, who hopes to train a Putnam Team when he is on a university faculty. Onofrei and Török said that the math department will offer several cash prizes for meritorious participation, and hope that more students will participate in competition in 2013.